Vibrance is an intelligent saturation adjustment tuned to correlate with the color sensitivity of human vision. The vibrance effect is applied with higher accuracy on a correctly white balanced image when the RGB Saturation and Lab Chromaticity sliders are set to 0. You can separately control the vibrance of pastel tones (tones of low saturation) and saturated tones (as the name implies, tones of high saturation). 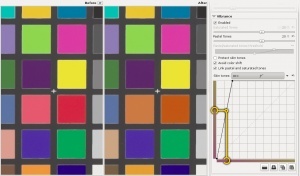 These Pastel Tones and Saturated Tones sliders let you individually control saturation of saturated and pastel tones. The threshold adjuster lets you differentiate between pastel and saturated tones - the threshold between what is considered a pastel tone and what is considered to be saturated. When enabled, colors closely resembling natural skin tones are not affected by the vibrance adjustments. When enabled, exercises extra control to avoid hue shifting. When enabled, the vibrance level is adjusted with a single slider equally controlling saturation of both pastel and saturated colors. Using the HH curve, a pinkish skin hue was changed to a tanned-brown one. This H=f(H) curve lets you change the hue of skin tones. It behaves just like the tone curve you know from any image editing program, but instead of working on a whole color channel it just works on a range of common skin tones. The x axis represents the input hue, and the y axis the output hue. Decide on the specific skin tone hue you want to change (the one your subject has in the photo), find it on the x axis, and then change the curve to map it to a nicer tone on the y axis. In practical terms, you can use this tool to map a British-pink suntan skin color to a nice Maldives-brown one. This page was last edited on 21 January 2014, at 09:05.